Last week was, undoubtedly, all about shoes. 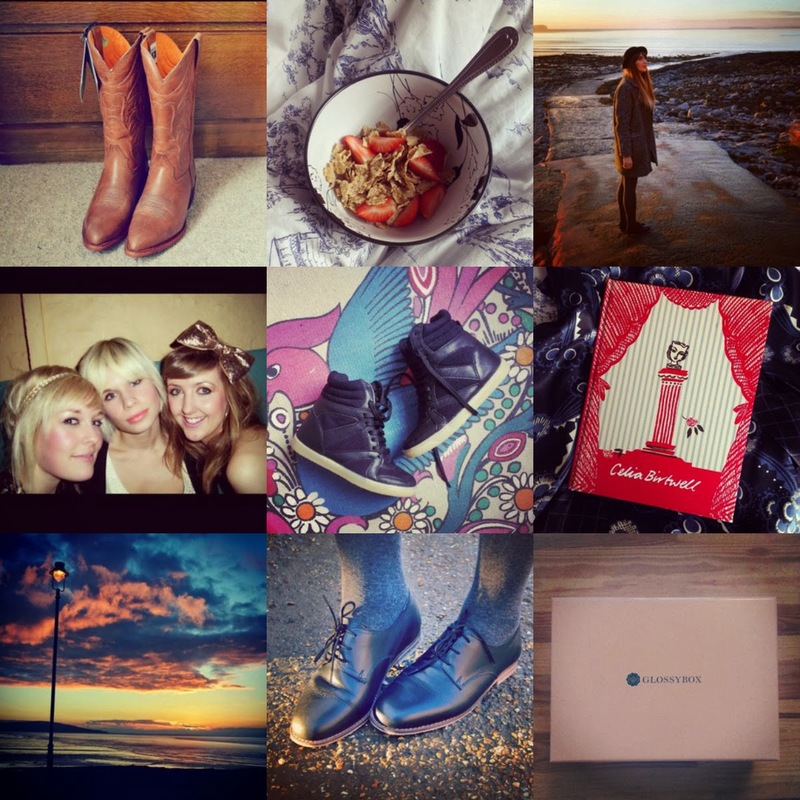 Just look at all the Instagram snaps I uploaded, a third of them dedicated to my favourite accessory. Also, just one of the pairs I showed last week were actually what I would consider to be my style; the brogues are something I always wear and love, but the the cowboy boots and hidden hightops? I promise I haven't had an attack of fashion madness or even succumbed to sale blindness, (despite both the new pairs being heavily reduced!) and I am always looking for new ways to update my style, so I thought I'd give them a try! I will be doing a complete post on the high tops soon, if anyone is interested in reading about them. It's also been a good week for charity shop buys, I snapped up a Celia Birtwell frock for a fiver (I'll try and put a full pic up soon to appreciate the beauty!) and I also scored a pair of jeans and a cute top too. I have already taken one bag of things to the chazza and I'm going to try and sort some more out tomorrow to take down. The January Glossybox arrived to poor reviews (read here) and I also spent a day in Weston and my mum took some lovely outfit pics for me. I was going through some old Facebook photos too and happened across this beauty from 2009. I remember this night because Adrian and I had just started courting and I spent a lot of the evening texting him, he was at a gig somewhere and I went out in my local town with my friends Kathryn and Laura. We all look so different now, the thing that made me laugh the most was my makeup, I don't know why I thought glittery yellow eyeshadow and pale pink lipstick would be a thing! And as for that hair bow! I can't even. On the other hand I can see how much my hair has grown since then! So funny.